Frequently, visitors to my site ask my opinion of other prophecy teachers, their predictions, interpretations and prophecy theories. This is often a tricky proposition because my answer can easily be perceived as attacking another man or his ministry even though I have no malice for other teachers, whatever they may teach or believe. The way I see it, we’re all sincerely teaching what we know to be true although without a doubt we are all in error on many points. The problem is that we don’t know which points are wrong until later (or we would not be teaching them). Thus, I have nothing against Walid Shoebat as a person or teacher. I wish him and his ministry well. However, in response to questions about his teachings and claims I would say, the ones I have looked at I have not found to hold up to careful scrutiny including the Berean test (Acts 17:11). In the end, whether CNN’s report is accurate or a smear, for me on prophecy he’s just another teacher who seems to mean well but ends up telling people to watch and wait for the wrong things. Islam’s influence today is scary to many believers, but that does not mean it will have a large end time role. Islam has been taking peace from the earth since inception just as the red horseman spirit was to inspire on the earth (Rev 6:3-4). Beyond that I find no end time role for Islam, including no verse requiring the Antichrist be a muslim. In conclusion, feel free to listen to Walid Shoebat and to test what he says for yourself. I’m not telling anyone to avoid him as to avoid considering any teaching is a missed opportunity to sharpen your discernment and critical thinking skills. And the same goes for me, too. Check what I say against Scripture and good logic (and do let me know if you find anything you think I missed). Is There Still Punishment For Forgiven Sins? Mark you should know you cannot trust CNN they are not Christians on the news and are part of the NWO just like cbs, nbc. Walid is a very good and trusting man. Anyway for your thinking of the MARK. OBAMACARE has the RFID CHIPS TO BE PUT IN US BY 2017. If you look around your city you will find RFID STORAGES ready for the act and Doctors that have been to meeting with Obama and have learned how to do it and are ready. The Old bibles say the mark is in the hand and in forehead. I looked it up in old bibles. They have put the RFID CHIPS IN some people now allready about 2 million some are because of Government jobs required to keep you job. Others are because people just wanted it. Some have tried to have them removed and found it is difficult i moves up you hand. Some have broken out with sores because it has a lithium battery in it and if it breaks which it will eventually you get sores on your body. Does not the bible say those who take the mark will break out in sores???? ?Go to 666themark.com to learn more. Thanks would love some feed back from this. You are right about CNN. I have caught them in several outright lies that can be proven to be lies. Also, their interview with one of the Sandy Hook witnesses was done with a green screen. Totally bogus and outright trickery. The answer to â€œwhy didnâ€™t I see that before?â€ when reading Walid Shoebat’s theories is because it’s not there in the Bible. =) It takes a self-proclaimed ex-Muslim authority telling you a lot of background material and rhetoric for you to believe a verse he cites supports his theory. Like Revelation 13 having Alah’s name when it’s not there at all according to textual scholars, etc. Very few discerning Christians in this day and age Tim. Too many idiots like Walid Shoebat who are mere converts and little more than common preachers, stupidly believing they are prophets or capable of uttering many prophecies. Walid has mentioned how easy it is to interpret prophecy, however nearly everything he interprets is tacky and wrong. He is no prophet, he is no proper teacher, he clearly doesn’t have the gift of spiritual discernment, and he is, like many other “Christians” these days, seemingly incapable of interpreting prophecies accurately or understanding them. I have served the Lord as a prophet for 19 years now, and idiots like Walid are the bane of my work and the work of my brethren. Aside from idiots who claim there are no prophets anymore, the ones who teach and prophesy falsely make our work incredibly frustrating, because their reputation for falsehood is shifted onto us. A time is coming, praise God, where both in heaven and in the millennial kingdom that true prophets and teachers will be separated from the false, and EVERYONE will know who is a true prophet and who is not. God Himself will vindicate us, and those who are false or self-appointed will either be in hell, or will never teach lies and deceive others ever again, as God will deal with them as they deserve with rigid humbling that will last for eternity. 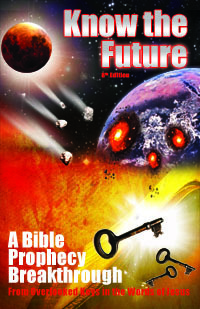 Are you saying you as a prophet heard from God it’s 60 more years until the end/2nd Coming?